Maxfield Parrish (American, 1870-1966), Prometheus, 1919. Oil on panel. The Illustrated Gallery, Fort Washington, PA.
Stockbridge, MA, July 11, 2018 – Norman Rockwell Museum will present a lecture on the working methods of artist Maxfield Parrish on Thursday, July 19, starting at 5:30 p.m. Ann Lawless, Executive Director of the American Precision Museum, will reflect on the many interesting facets of Parrish’s career. The event is free for Museum members or included with Museum admission. 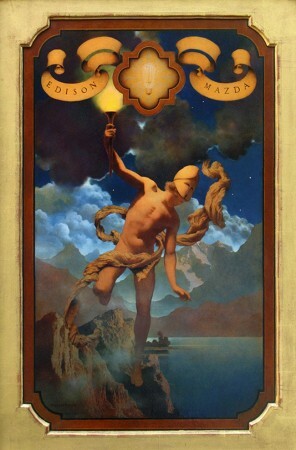 Maxfield Parrish (1870-1966) was one of the most recognized working artists in America in the 1920s. For all of his working life, Parrish, who lived and worked in Plainfield, New Hampshire, maintained a fully equipped machine shop on the lower level of his studio. The casual viewer may think that the enchanting, nostalgic appeal of his art sprang full-blown from his imagination, however his work belies a strong connection between artistic fantasy and technical reality. Parrish’s unique paintings were commissioned for book illustrations, magazine story illustrations, building murals, calendars, and commercial advertisements for companies like Colgate, General Electric, and Edison Mazda Lamps. By utilizing bold colors to illustrate fantasy images, Parrish created paintings of great and lasting beauty. Special 15 minute gallery tours of Keepers of the Flame are held daily at 10:30 a.m. and 3 p.m., and are free with Museum admission.